Top prize for top dog: $100,000. The contest is presented by Facebook Watch, where dog owners from as many as 35 nations are submitting audition videos. “Ricochet … has her sights set on representing San Diego, and raising awareness of the causes she supports,” said a statement from the Escondido canine’s handlers. The contest is similar to “America’s Got Talent” with several rounds of dogs competing against each other in video productions. For every audition submitted, Facebook will donate $1 (up to $1 million) to the ASPCA. Show judges and Facebook users will have a vote. Ricochet is in third place in the one-vote-per-person contest. Voters can go to Ricochet’s Facebook page — where the contest video is pinned to the top of the page. “‘World’s Most Amazing Dog’ demonstrates our commitment to reinvent show concepts by adding interactive and community elements that put audiences at the center of the experience,” said Facebook’s Paresh Rajwat, head of Video Products. Ricochet is most known for her canine-assisted surf therapy work for kids with special needs, people with disabilities, wounded warriors and veterans with PTSD. The video she submitted to the contest highlights some of the hundreds of individuals she’s assisted on a surfboard over the past decade. Star of her own website, she works as a certified goal-directed therapy dog with Paws’itive Teams and Naval Hospital San Diego’s canine-therapy program for service members with PTSD. 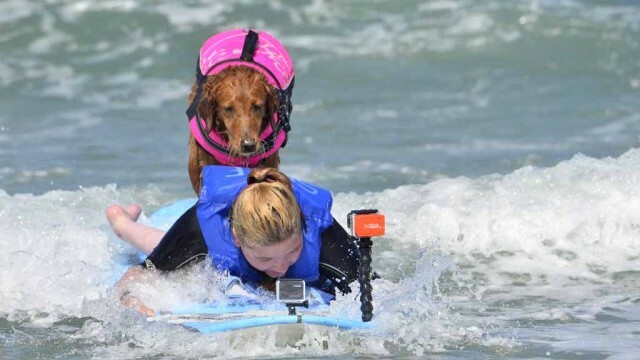 She also has her own program called Waves of Empowerment which matches kids with special needs and veterans with PTSD for a day of canine-assisted activities, healing and therapy.